Frederic Remington, Legging, Ink on Paper, c. 1889, 10" x 7"
Frederic Remington was born on October 4, 1861 in Canton, New York to a prominent family. He was related to Western portrait artist George Catlin and cowboy sculptor Earl W. Bascom. Frederic grew up during the Civil War hearing epics from his father of his life in the cavalry. His early attempts at art were drawing and sketching soldiers in uniform on horseback. It was also the influence of his father's newspaper business that taught Remington how to capture a story to illustrate his romantic version of the West and its struggles. From a very young age he was drawn to the West and enjoying the great outdoors hunting, fishing and hiking. 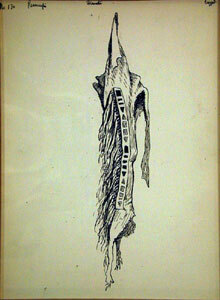 Remington's father expected Frederic to earn a college degree, so in 1878 he enrolled at Yale's School of Fine Arts. His father passed away a year and a half into his studies, and at that time he went to Montana to try out life on a ranch. He only lasted two months before he left there and used a small inheritance to buy a sheep ranch in Kansas. That endeavor lasted only about a year, and Remington married his childhood sweetheart, Eva Adele Caten, in 1884 and moved to Kansas City to invest in a hardware store and a saloon. 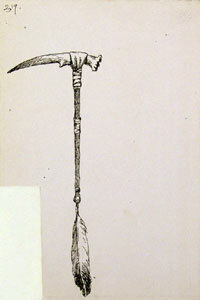 Frederic Remington, Tomahawk from Deer Antler, Ink on Paper, 9" x 6"
Not enjoying the hard life in the West, the Remingtons moved back to Brooklyn, New York in 1885. Frederic studied briefly at the Art Students League, but spent a great deal of his time traveling to Arizona, Texas and New Mexico. He was becoming well known as an illustrator for magazines such as Harpers and Theodore Roosevelt's serialized articles for Century Magazine. The subject matter was almost exclusively his mythic sketches of the Western frontier, cowboys and the military. He would even self-assign reporting missions to the West, resulting in many articles both written and illustrated by Frederic Remington. In 1888 he won the Hallgarten and Clark award at the National Academy of Design exhibition. The following year he was awarded the silver medal at the Paris International Exposition. It was during the mid-1890s when Remington began to learn and quickly master the medium of sculpture. His initial attempts were using the sand cast method that was traditional at the time. But after being introduced to the lost wax process all of his subsequent castings were done using that method. In 1898, Remington interrupted his sculpting to go to Cuba as a war correspondent and illustrator reporting on the Spanish-American War for Harper's and New York Journal. He witnessed the assault on San Juan Hill by American forces led by Theodore Roosevelt and others. This experience caused Remington to become deeply disillusioned by the reality of war and how appalling rather than heroic it was. Upon his return, he retired for a time of healing at an island retreat he owned on the St. Lawrence River. It was here that he did some of his best sculpting work. He became known for not only the detail and dramatic movement in his pieces, but for the life-like portrayal of his subjects. In a career that spanned less than twenty-five years, Remington produced more than 3,000 drawings and paintings, twenty-two bronze sculptures, a novel, a Broadway play, and over one hundred articles and stories. John Ford's film "She Wore a Yellow Ribbon" was inspired directly by Remington's work. The "Marlboro Man" in the well-known cigarette ad was one of Remington's illustrations. His legacy is more about a portrayal of the heroic figures who settled the West and their life-and-death struggles, rather than so much about what he experienced personally on his journeys. He gave Americans stories about what they wanted to see in themselves - independence, bravery and optimism. Even though he only actually lived in the West for only a year, he inspired a love of the West and is reputed to be America's most popular nineteenth century artist. Frederic Remington passed away in 1909 at the age of forty-eight following an emergency appendectomy.